This study evaluated how different nitrogen forms affect growth and photosynthetic responses of cassava to CO2 concentration. Cassava was grown in 14-L pots in a greenhouse at 390 or 750 ppm of CO2. Three nitrogen treatments were applied: (a) 12 mM NO3 −, (b) 6 mM NO3 − + 6 mM NH4 +, and (c) 12 mM NH4 +. Thirty-six days after treatments began, plants grown under elevated CO2 and fertilized only with NO3 − (750_NO3 −) had photosynthetic rates similar to plants grown under 390_NO3 −, indicating significant photosynthetic acclimation to CO2. 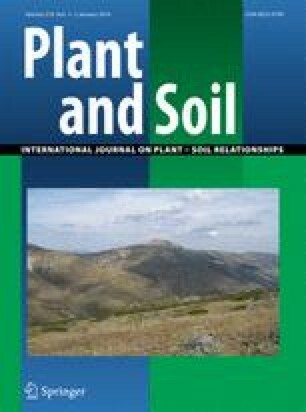 In contrast, photosynthetic rates at elevated CO2 increased as NH4 + increased in the nutrient solution, such that photosynthetic acclimation was reduced for plants fertilized with only NH4 +. However, this positive effect of NH4 + on photosynthesis was not observed in more advanced growth stages, and the toxic effects of NH4 + severely reduced total dry mass for these plants measured at the end of the experiment. Our results indicate that cassava will respond with increased biomass accumulation in response to raising atmospheric CO2 levels, and that N form can have an important impact on the photosynthetic response. However, the positive effect of NH4 + fertilization on cassava photosynthetic CO2 response eventually led to a toxicity problem that reduced biomass production. The challenge is to determine how to manage NH4 + fertilization so that the photosynthetic benefit observed in the initial phase may persist throughout the crop cycle. Responsible Editor: Herbert J. Kronzucker. We thank Deborah Pelacani and Maria Cláudia P. Cruz for kind help in growing plants. Also, thanks to Leonardo Zebral Rodrigues by the providing in vitro plantlets.